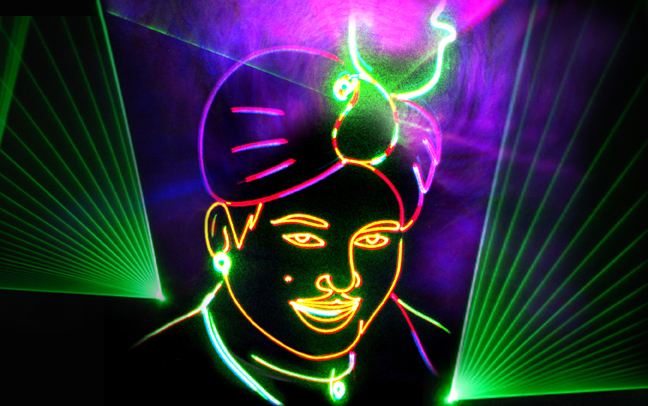 A laser portrait of P. C. Sorcar, the legendary magician, by his son Manick Sorcar. I have unforgettable memories of growing up in Calcutta, at our home in Ballygunj named ‘Indrajal’. My father, the legendary magician P C Sorcar, was on the road 9 out of 12 months, touring the world with his magic shows. He came back with a treasure trove of stories from around the world! I always looked forward to seeing the world through his eyes. I loved painting since childhood, but I could combine my love for painting with lighting only when I started working backstage at my father's shows. That was my first exposure to the magical world of lighting. At first, I painted the backdrops for different magic items. My father was very impressed and encouraged me to do more. Soon, I started playing with lighting to enhance my artwork, which prompted me to do complex lighting designs for many of his intriguing magic items. I realized I was more interested in the magic of mixing art with science than doing stage magic and I was enamoured with this new finding. Another event that I vividly remember was in 1964. My dad was about to premiere the "Sputnik Illusion" item in his magic program. The magic was about a Sputnik, which took two astronauts fly through the space and land at Mars only to find the astronauts had vanished in thin air. When the Sputnik returned to the earth, they reappeared instantly. One of the major strength of this great item was the background scene where the Sputnik went through space passing by the stars, planets and the Nebula to reach the Mars. For this spectacular visual effect he had a special circular movable glass dial shipped from the US, which had space scenes with stars, planets etc. painted for projection on screen. But unfortunately, one day prior to the show premier, an assistant accidentally dropped the glass dial shattering it into pieces. No one dared to report the incident to my father, as we were scared, and desperately looking for an alternative solution. It took me the whole night to collage pieces of mica sheets with scotch tapes to form the shape of the circular damaged dial, and then carefully paint the space scene on it. We mounted it on the spool and let it run, while we held our breath. With God's grace, the show went flawlessly and was highly appreciated by the audience, which pleased my father. Later, when he was told about the incident, he looked at me and said with a smile, "That was magic, son!" Many years have passed since my father passed away. My interest in blending art with light took me to the USA where I earned an MSEE and continued to create my own magic in myriad ways under my nickname, Manick Sorcar. Even as I made Denver my new home and started a family, I continued to pursue my interest, and with his blessings, managed to carve a niche for myself as an artist, animator and laserist. My animation films, all based on stories from India, have been telecast in the USA for the last 20 years in a row, bringing a host of awards from international film festivals. For my stage shows, I tamed the sharp, fiercely bright ray of laser and used it as a harmless, soft painting brush. I successfully mixed performance of live actors seamlessly with 2-D and 3-D laser images on stage for which I was humbled to be recognized by two Oscar-equivalent awards of the laser industry. The credits for all these go to my father, who kindled in me the interest in mixing art with science. 2013 is the birth centenary of my father. After debating in my mind how to pay my tributes to him in a fitting manner on this great occasion, I felt, the best way was to present some of his magic items with laser. With that in mind, I flew out from the USA to Kolkata last December to perform with my team at Mahajati Sadan, the prestigious theater of the Government of West Bengal. The show ran packed house continuously for 10 days, much to the delight of the audience who enjoyed the items in the light of the 21st century. At the lobby, I also held an exhibition of my artwork about different stages of his life, where I displayed dozens of portraits made with laser and other types of media, which were promptly picked up by his ardent admirers and curators. The lighting design books written by me have become texts at the universities in India as well as the USA. The ‘Laser Lighting for Art, Animation and Entertainment’ course that I introduced as a part of llumination engineering degree at Jadavpur University has taken off to a good start and the university has built the ‘Manick Sorcar Laser Animation Laboratory’ where I contributed all the laser equipment. It fills my heart with joy to think my love for art and lighting have come to fruition. It has opened up a new exciting career opportunity for students in India, and I thank my father for being the inspiration behind it.